I had a great idea for my cabbage soup. 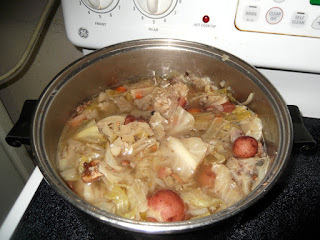 Lacking a brisket of corned beef, I decided to trick my cabbage into thinking that its familiar companion the corned beef was in the pot with it. Below is the resulting recipe. 2. Cook to a boil over medium-high heat. 4. Wash potatoes and set aside. 5. Then wash the carrots and microwave them in a microwave cooking container with a steam filtering lid for 20 minutes on high. 6. When Dutch oven comes to a rolling boil add potatoes and cook for 20 minutes on medium heat. 7. After carrots are done, drain and put in the pot, then cook for another 15 minutes. 8. After this time is up, add cabbage and cook until the cabbage is done, about another 20 minutes. I must say that I was delighted by the results. Using the corned beef seasoning to season the cabbage soup was a good idea after all. It tastes as if there is really corned beef in it and has now become a regular soup on our menu. Furrr Sales, Furrr Sales, Happy, Happy Faux Fur Sale! Yes, I'm back. As you know it's that time of the year, where stores are stocking items for their Spring sales. What this means for us is great saving on those "I want them, now!" winter items that were just a little bit out of reach, but are now lower to where we can manage to fit them into our budgets. Today items are for those of us who love faux fur that are fun to wear and make us look downright fabulous. You know it, girl! Well, today at Roaman's, the faux fur sales are on. Below are three of the faux fur coats that are just so dreamy that they make you think of wrapping yourself up in one on the sofa with a nice hot mug of mulled wine and a nearby fire. 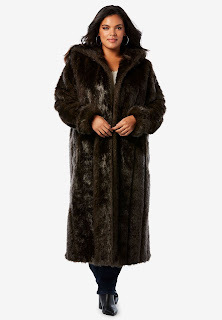 First there is the Roaman's Full Length Faux-Fur Coat with Hood. It is down from $359.99 to $129.99, and as a clearance item comes in sizes M (14-16), L (18-20), and 1X (22-24). Sorry, girls. The only style left is the fox as pictured. 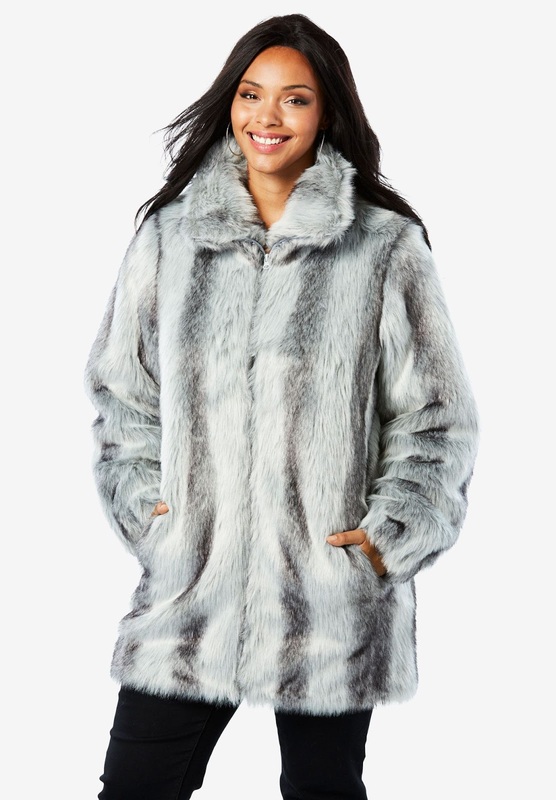 Second, this hooded faux fur group are in sizes M (14-16), L (18-20), 1X (22-24) and 2X (26-28). 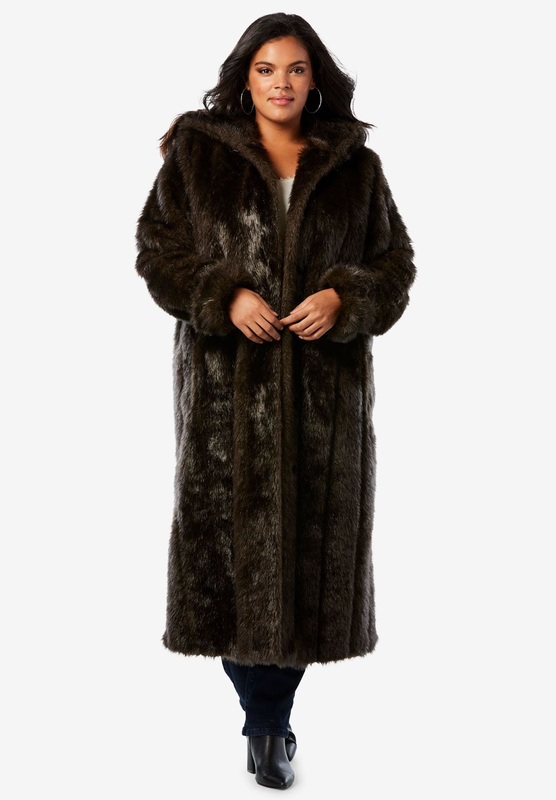 These faux furs comes in styles of chinchilla, black and ranch. 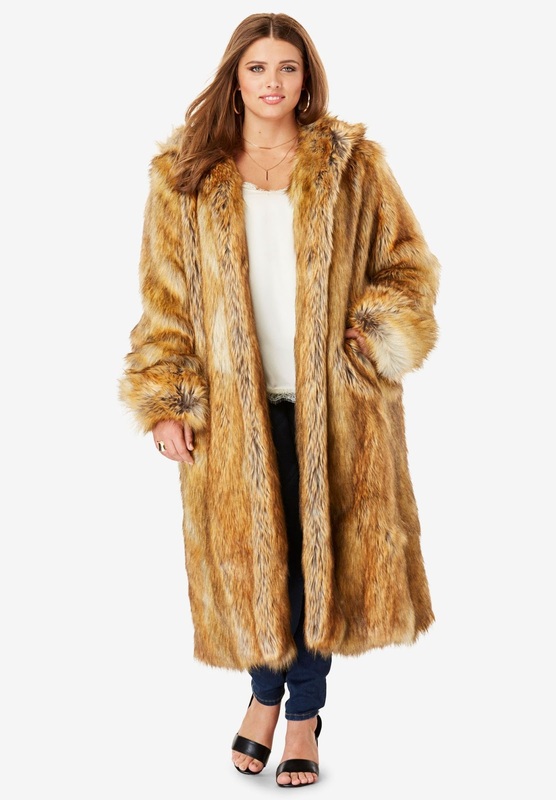 And lastly, there is this three-quarter length Short Faux-Fur Coat that also comes in ranch, chinchilla and fox. They are down from $199.99 to $99.99. Wow! What are you waiting for??? Grab up your faux fur, some fresh fruit, bread, ham and cheese, that aforementioned warm mulled wine, and your favorite man and go party the evening away on a wintertime picnic. And don't missed out on Roaman's Buy One, Get one 80% off winter sale as well. 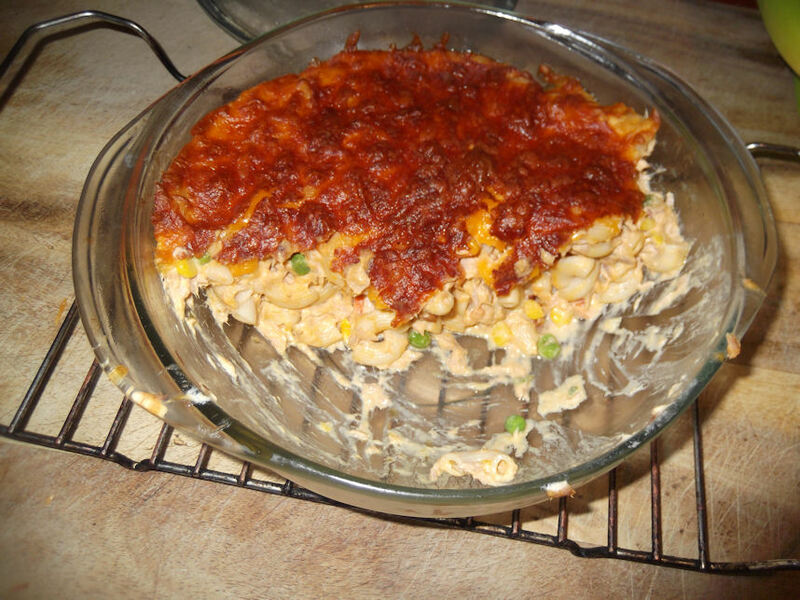 Today I am sharing my latest air fryer recipe, a tuna casserole dish. I wanted a change from my old recipe, so I changed it up a bit. And all that I can say is that I wished I had thought of this sooner. It tastes great! I hope you enjoy it as well as Stan and I do. About the picture. There was an even amount of casserole left in the dish after I served it, but Stan decided to nibble on a little more before putting it in the refrigerator. Drain tuna and set aside in a large bowl. Prepare macaroni as directed on box. While the macaroni is still cooking drain the mixed vegetables; stir them into the tuna bowl with the creamy cheddar cheese that came with the macaroni and cheese. Then add the flour , sugar and sour cream. mix well and set aside. Remove macaroni from microwave and drain. Preheat air fryer for 10 minutes on 350 degrees. Add macaroni with some butcher ground black pepper, and salt for taste to tuna bowl. Mix well. Pour ingredients into a 2 quart casserole dish that has been sprayed with butter flavored cooking oil. Add two layers or more of extra sharp shredded cheddar cheese on top of tuna casserole. Spray top of shredded cheese lightly with the butter cooking oil. Place casserole in hot air fryer. Remove from air fryer and let cool for 5 minutes, then serve.